The next step is to cut two very fine pieces of solder. I use Silvabrite 100, a Tin/Copper/Silver alloy, for most of my soldering. It is stronger than conventional lead solders, flows very well, and melts in the 450 to 500 F (230 to 260 C) range – just below the temperature at which steel blues. Stay-clean flux works very well with Silvabrite 100 solder. Rarely do I need to braze or silver-solder the parts on a clock – the strains involved are typically not severe enough to warrant such efforts. I find that bits requiring more structural strength than what is provided by Silvabrite can typically be reinforced with a small bit of metal. 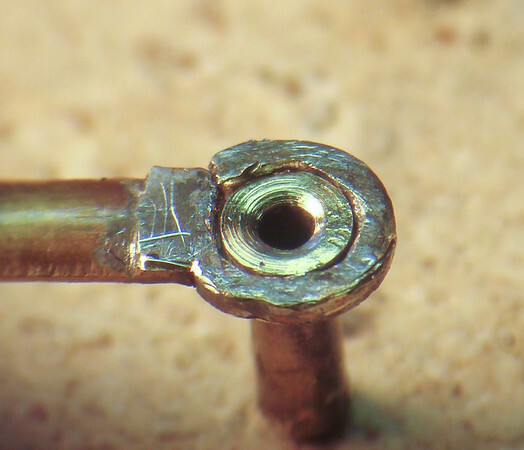 I find this easier than the more challenging effort of brazing or silver-soldering very small parts with the resultant degradation in metal strength.